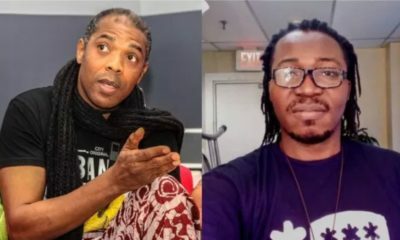 Femi Kuti has reacted to accusations by ex-band member that he sexually molests underage members of his music band, Positive Force. The messy allegation had cropped up when the son of legendary Afrobeat music creator Fela Anikulapo Kuti tweeted about a member of his band, Aghedo Andrew, who disappeared 20 minutes before their show that took place on the 29th of July at Summer Stage, New York. The Bassist according to Femi Kuti’s tweet had left 20 minutes before the show without a word from him and that almost ruined his show which he claimed came out successfully eventually. This was followed by his sister Yeni Kuti’s comment asking Donald Trump to find and deport the unreliable basist. 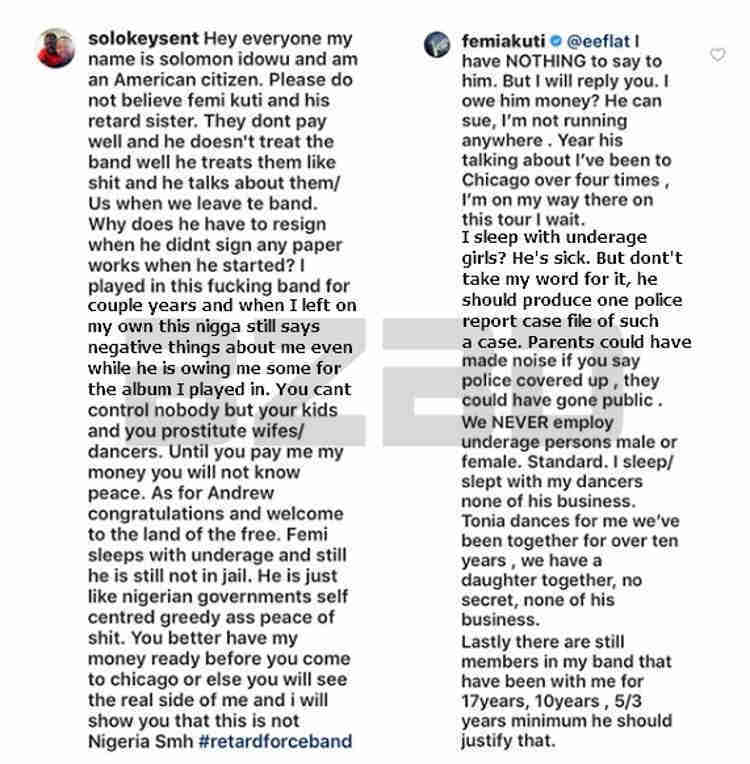 Events took a dramatic twist when a certain Solomon Idowu (Solokeysent) who claimed to be an ex-member of Femi Kuti’s band responded to the Kuti’s messages on Instagram. 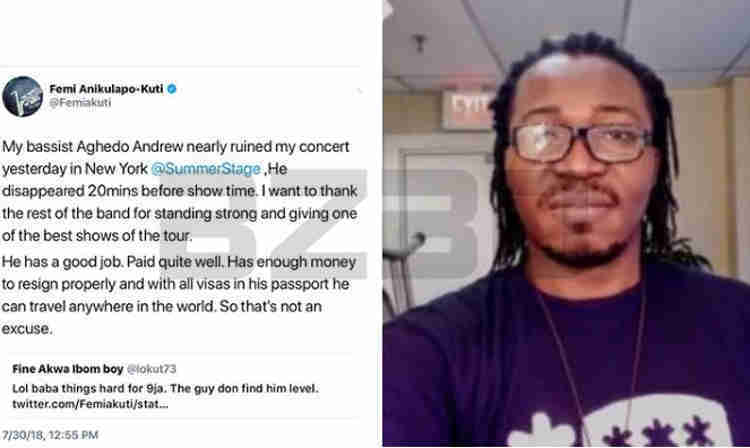 Solokeysent applauded Andrew for leaving the band since Femi Kuti and his family treats them with utter disregard. 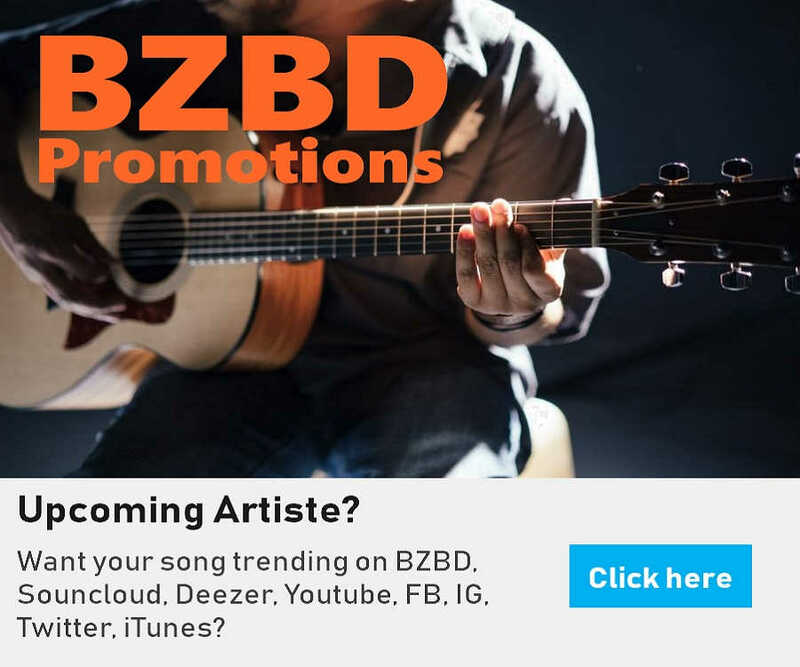 He went the whole hog to revealing that the singer is owing him backlogs of salaries, and also accused the singer of sleeping with under-age members of his band and wonders why Femi has not been jailed for this offense. 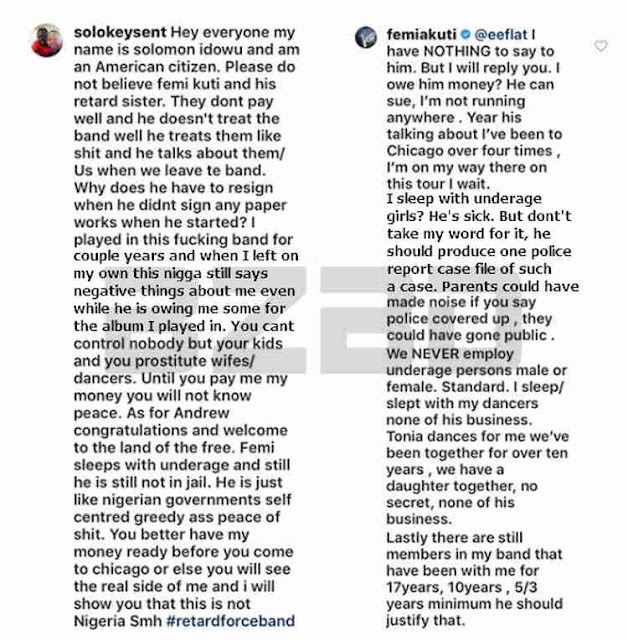 Responding to Solokeysent, Femi Kuti reffered to him as sick for accusing him of sexually molesting young band members, claiming no parents of any of his band members have ever come out to accuse him of such. To further buttress his point, Femi claimed that its a policy not to employ underage persons either male or female. He, however, admitted to having had an affair with one of his dancers, Tonia, but asserted this is none of Solomon’s business considering the fact that he has a daughter with Tonia.